oh and i went apple picking too - it was amazing. i don't think i will ever be to old to go apple picking. the apple orchards in new england where hit pretty hard by an early frost in the spring which damaged many of the young flowers on the apple trees - several orchards were unable open up their coveted pick your own section and if they did it was very limited pickings. one of the local orchards in canterbury, to say the least was very lucky - several of their trees were spared, they even opened up a very old part of the orchard that hasn't been seen by the public in 30 years- a special treat for the pick your own peeps. 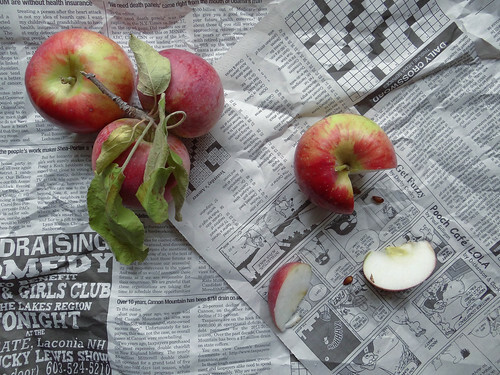 and let me tell you, the apples are incredible this year, super sweet and crisp. some of my personal favorite fall & early winter favorites. the pumpkin donuts are baked up with a simple pumpkin pie spice and canned pumpkin, then dipped in a simple white glaze and coated with cinnamon sugar. 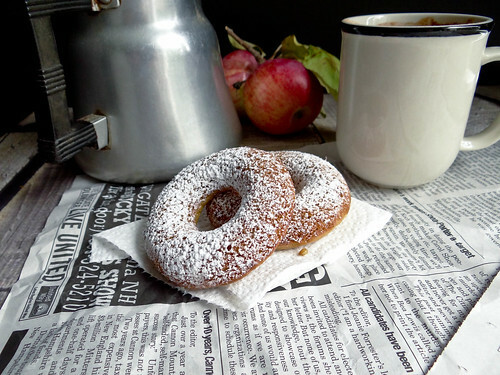 in the apple crisp donut you will find little bits of apple with bits of a classic "crisp" topping baked right into the ever so slightly spiced donut. 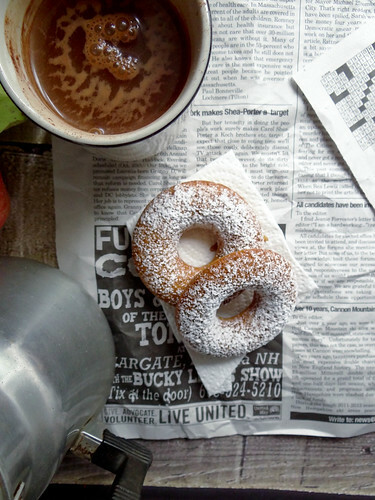 the gingerbread version has sweet notes of molasses and spicy hints of ginger - the perfect donut to go along with your cup of tea. 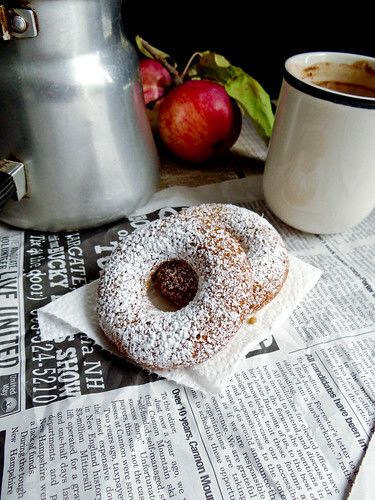 second to banana pancakes on sunday morning i love a good home baked donut. they are super easy, taking only a few moments out of your morning - making someone you love morning extra special. feeding a crowd? make all three! heading to a fall football game - bring a dozen! going on a fall hike? tote along a thermos cocoa or coffee and you have your perfect snack when you reach the top of the mountain. 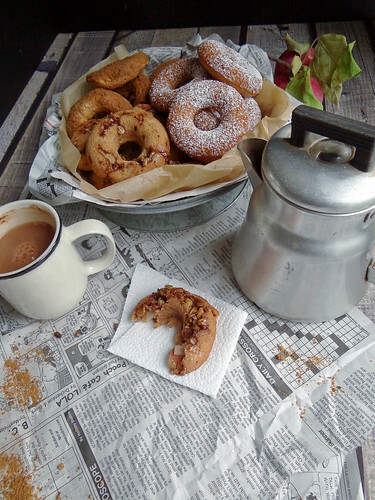 baked donuts are a tad bit healthier than their fried counterpart and a whole lot easier to make. they are best eaten the day they are made but still quite tasty the next morning. 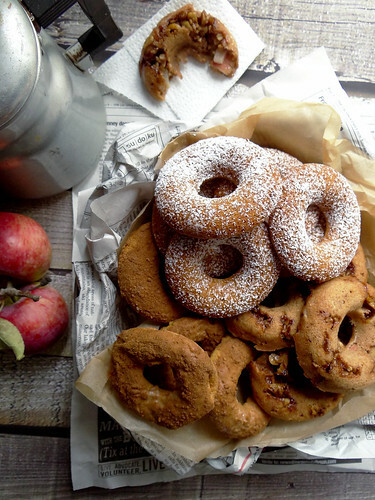 so grab your donut pan, whip up a batter or two or three and make donuts for someone you love. 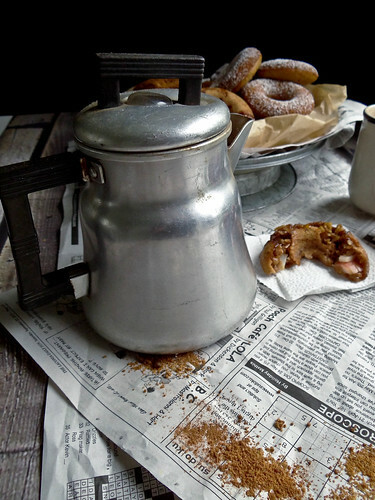 what do you typically make on Sunday morning for the ones you love? 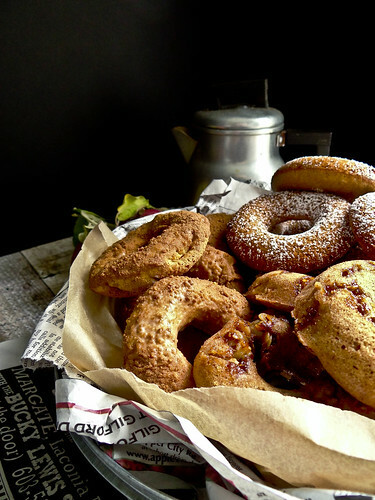 do you have a favorite donut recipe or corner bakery donut that you pick up on the weekends? make the crisp topping by combining 1 tbsp vegan butter, 1 tbsp coconut or brown sugar + 1 tbsp oats - mashed with your fingers until mixed forms small clumps - sprinkle into each donut mold before piping batter into the molds. pumpkin donuts - dip one side of the donut into the glaze; place the super fine sugar & cinnamon in a ziploc bag and toss the glazed donut until coated with the cinnamon sugar- repeat with remaining donuts. 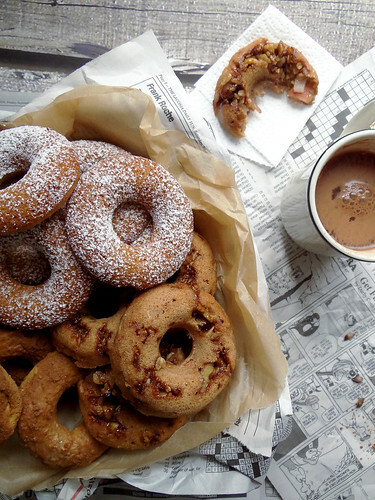 Those donuts look so divine! Thanks Lysa - I had fun taking these pics! Holy Crap! I actually yelled that at my computer when I first saw your post! *hehe* Everything look AMAZING!!!!! Wow! I don't know which flavour I'd try first! I love them all! AWESOME post hun! Love it! :) I cannot wait to try and make donuts. Gorgeous photos! Hahahaa you are so funny! They were so good - I totally wish you lived closer cause I would have totally loved having a cup of tea and eating these with you! 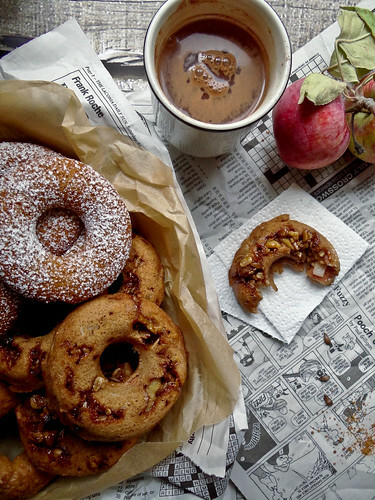 Lovely photos and your baked donuts look amazing! 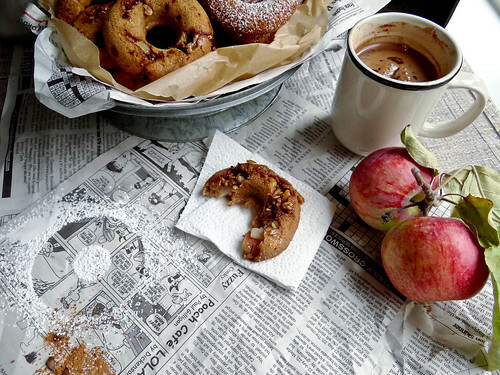 Perfect for a fall morning. 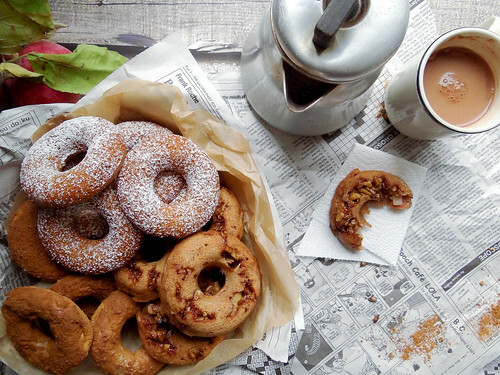 Donuts and baked too!!!! Dig that they are made with agave and coconut oil. Perfection. The photos on the Sunday funny papers are great. They were delicous... waiting on the next batch..
Beautiful photos, Heather! 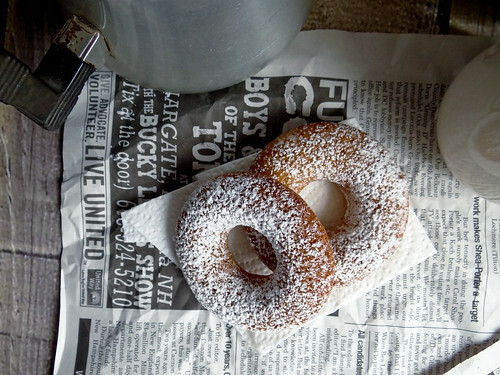 I just made my own donuts, for the very first time (fried, not baked... 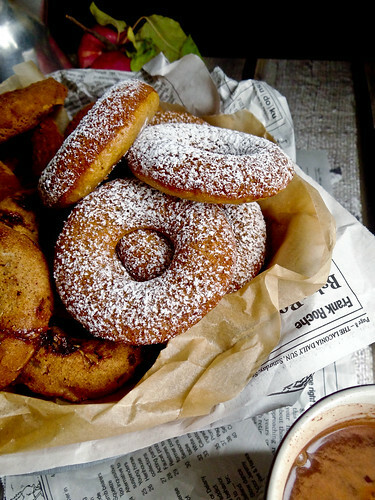 I need a donut pan!) Those gingerbread ones sound so incredibly good! I'll take 3 dozen please :) Amazing flavours, I don't think I'd be able to choose, although lucky for me, looks like I don't have to! It was dangerous having this many donuts around....I like to test all my recipes and I was like holy crap I need to test 3 donuts....what a tough job! Hahah you are so right! 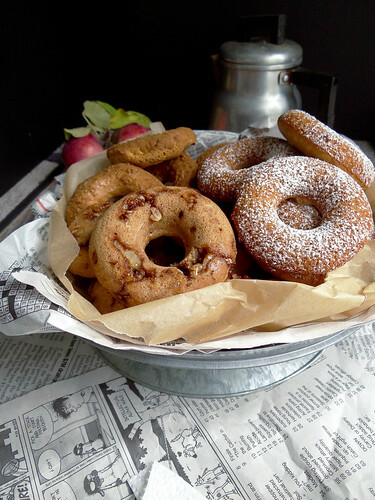 You dirty rat, I think I could eat a dozen of those, I have a mini donut pan, thankfully it makes bite sized donuts and only a few ;) So good Heather! I am pretty sure I need a mini donut pan - or at least I am pretty sure my hips would thank me :) You are so smart - huh I should have totally aked for a mini donut pan :0 well there is always this christmas! 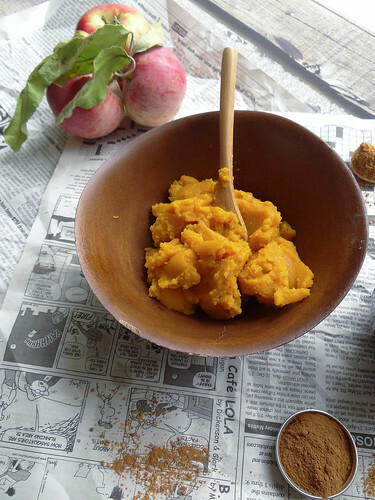 Hey, are you signed up for the Virtual Vegan Potluck? It's on November 1st, World Vegan Day. C'mon Kristy, Sparkles, me and more are in! www.virtualveganpotluck.com It wouldn't be the same without you! Strangely, I didn't like donuts until I became vegan. If I have them, I like to bake them so I know that they're healthier. These all look so good- I don't know which ones to try first! They look incredible! Great flavours too, very autumnal. I'm making the gingerbread ones my top priority to try. aw apple picking! how fun! 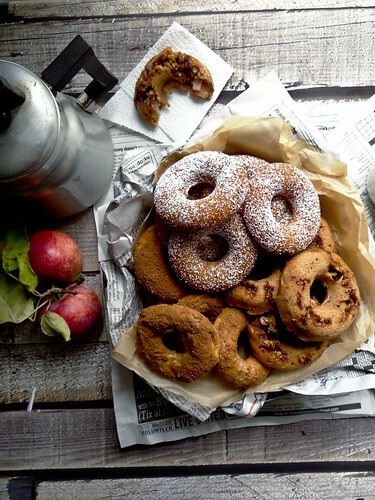 my goodness these donuts look incredible! i don't know which I'd like best, because they ALL sound marvelous! You are just killing me with these donuts!! They all sound soo good! 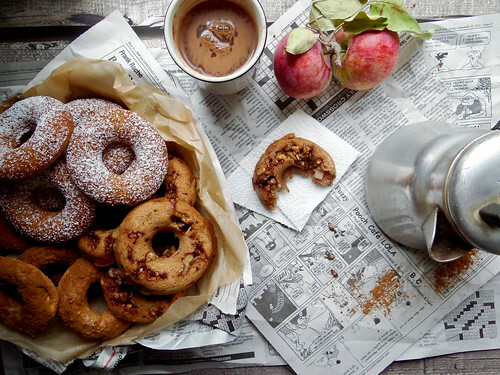 Somehow my baked doughnuts don't look like this! Maybe that's a good thing ;-)! Beautiful. Thank you so much for joining the Virtual Vegan Potluck! We've got a great turn-out and it should be a really fun event. Hi Annie! Thanks for stopping by, I am so excited to be a part of your Vegan Potluck, it sounds like an event not to be missed! Thanks for stopping by! I am so happy to hear that you made the donuts - do you think by chance your baking powder was older...after I read your comment (and I have also made this recipe multiple times) I went back and made up a batch of the Gingerbread with the specified amount listed in the recipe and they rose quite beautifully, sometimes when you use older baking powder it doesn't have the same reactivity - ot if you are in a higher altitide that could effect the rising.